Here’s another notch to add to a wall of recipes that includes the Cheeseburger Dumplings, Buffalo Chicken Dumplings, Broccoli Cheddar Dumplings, Apple Brown Sugar Dumplings, and the Hot Dogpling—stuff you don’t normally see in Asian pan-fried dumplings, or potstickers. Quintessential as they might seem in hindsight (my friends and I certainly feel that way after gobbling up panfuls of these pizza dumplings last night), they’re recreations of favorites in the name of dumpling fun. And fun is what’s on the menu at the 13th Annual Dumpling Festival this Saturday, 12pm-5pm at the Sara D. Roosevelt Park in Manhattan, to benefit the Food Bank for NYC . Don’t believe me? I covered this friendly event last year, and had my fill on ‘fun with dumplings.’ Chef One, the Brooklyn-based dumpling maker who hosts this shindig, kindly asked me to cover #dumplingfest2016 this year, and I thought I’d give it a twist. How can you not? This year’s theme at the festival is “There’s A Chef in Everyone.” And I couldn’t agree more. So while I hermdy-hermd as my inner Swedish Chef last week, I came up with a dumpling recipe that I hoped might inspire more dumpling madness in its wake. 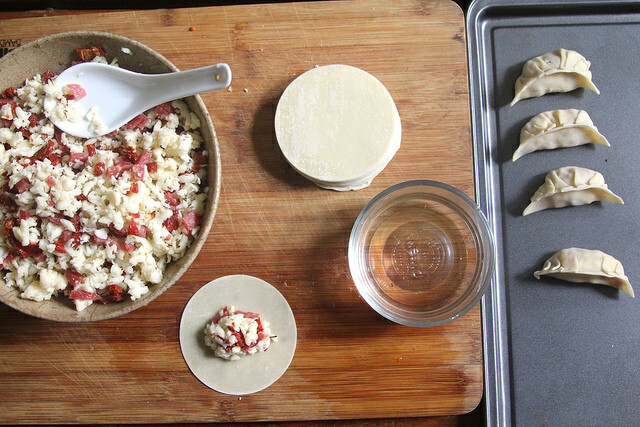 Are pepperoni pizza-themed dumplings the ultimate chef’s no-no or genius? It’s either or both—but it’s great! And it goes down even better dunked in marinara sauce. I can be a purist when it comes to many things, dumplings included, but if something tastes good, then that’s pretty much that. I had an idea that pepperoni pizza dumplings would taste alright, but I didn’t fully realize the dream until Karol, Diana, Noah, Olen and I really got down and noshed on them for an impromptu dumpling-making party last night. Noah sagely brought along makings for true pork and chive dumplings of my youth. Along with that, we made pepperoni pizza dumplings, and a seemingly requisite kale Caesar salad. The photos of the finished dumplings, oozing with bubbly cheese and pepperoni grease, don’t really do them justice. 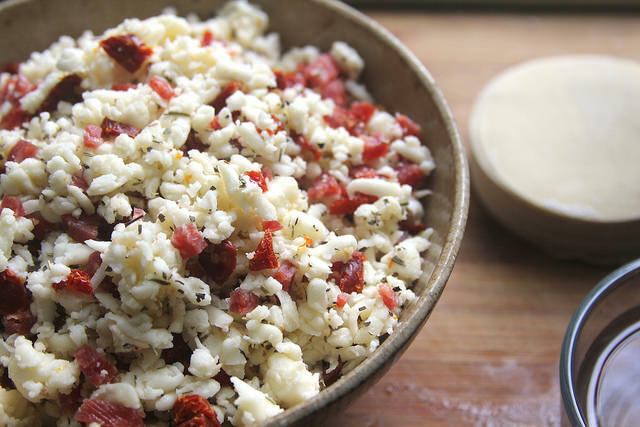 To assuage the incident of too much moisture that would make the seals on the skins break while cooking, I used cheap bodega mozzarella instead of fresh, and chopped up some sundried tomatoes instead of fresh ones or sauce to put inside the dumplings, too. Finally, to give them that smack of something-you-wouldn’t-find-in-normal-dumplings-but-would-a-frozen-pizza, I dusted the filling with some dried oregano. Did the trick. My dog Doug even snatched a raw dumpling off the tray and reported that it was pretty tasty, too. This dish bears many similarities to the signature flavor of a trashy favorite in this country known as the Hot Pocket. But I think we’re the better for it, rather than feeling the effects of its striking forebear. None of us had to call in sick the next day. 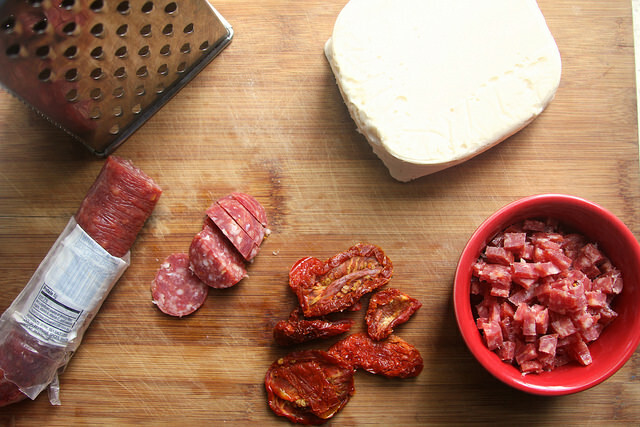 Combine all the ingredients except for the wrappers, oil and marinara sauce in a large bowl and mix thoroughly. 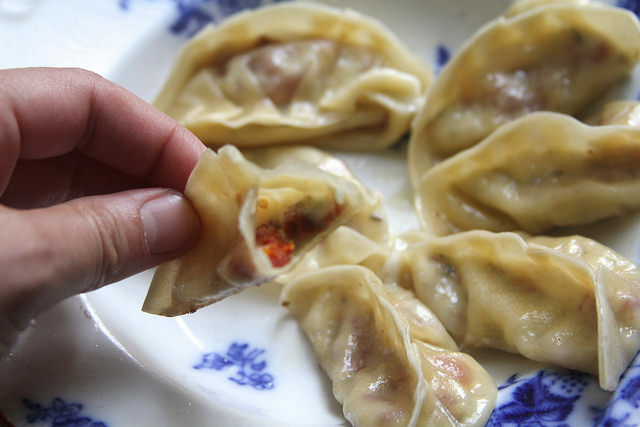 To fold the dumplings, place a spoonful of this mixture onto the center of a dumpling wrapper. Dip your finger into a small bowl of water and trace the edge of the wrapper. Fold the wrapper in half and make a pinch at the top; next, bring a piece of the edge about half an inch to the right of the pinch over to the pinch. 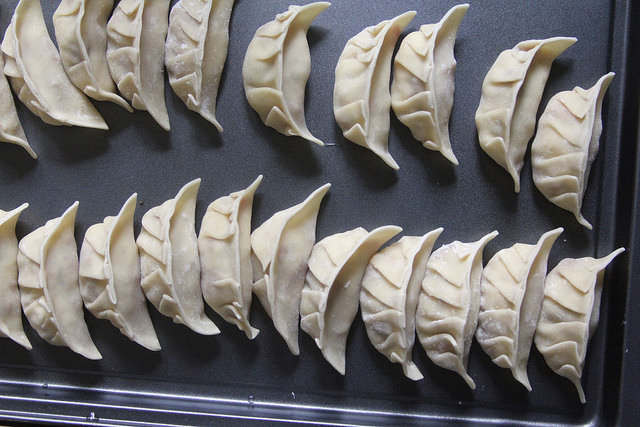 (This will cause the wrapper to fold diagonally on the right hand side of the dumpling.) Bring a piece of the edge half an inch to the left over to the pinch next. Pinch the pieces you brought to the center shut and continue to seal the edges to the left and right until the dumpling is fully sealed. From an aerial view, it should be shaped like a crescent. Heat one tablespoon of the oil in a non-stick skillet that comes with a lid over medium-high heat. Arrange the dumplings in a circle around the edge of the pan. Fill the center with as many dumplings as will fit – do not squash them against one another too much (you will probably need to cook in 2-3 batches, depending on the size of your pan). Let cook uncovered 1-2 minutes, or until the bottoms of the dumplings are just beginning to lightly brown. Add about 1/4 cup of water to the pan and cover the pan immediately. Let cook covered for about 3 minutes, or until the wrappers appear transparent rather than whitish at the edges. Uncover the pan and ensure that all the liquid has evaporated. Carefully loosen the potstickers from the pan with a spatula. To make a fancy plating, place a plate on top of the dumplings and invert the pan, to serve the dumplings crispy side-up. Otherwise, just transfer the dumplings to a serving plate with a spatula. Serve with the marinara sauce for dipping or just spooning over the whole plateful of ’em. Seven brownie points: No, Hot Pocket-esque foods do not a healthy meal make. But at least you can be in control of the ingredients that go inside—and not riddle them with preservatives, food coloring and who knows what. It’s about as cheesy and greasy as a pizza, or pepperoni-laden lasagna, and does not have much to say for nutrients. But served along with more healthful dishes and in moderation, it’s a fun retreat. Two maple leaves: This is mostly processed cheese, processed meat, and refined-flour dumpling skins. Not a great combo for your health and non-local (although the use of meat is minimal here). I have an useful article for you just from our website get the tutorial that helps you to delete cookies in windows 10 pc easily in few steps. Win a free pizza & gift card by taking the panda express survey.